Agnes says: Rating: Excellent. "I found Ergonomic Home on the internet, but called them to ask questions about custom sizes. He was helpful and accurate, and took time to answer all my questions thoroughly. Jean from California says: Rating: Excellent, Prompt delivery. I really like the keyboard tray and adjustable keyboard mechanism. Merchant went the extra distance to make sure I purchased the correct product. Amy from Texas says: Thanks so much for your prompt reply. I placed my order today. My husband and I are very impressed with your site and products available (and the sale prices - best on the web). Thanks for providing this service! Nancy from Minnesota says: "Excellent, not only was I able to find what I needed through Ergonomic Home.Com, but I could actually look at it on line before ordering. Thank you for your fast and courteous service." Joe from New Jersey says: "Excellent! I placed a rush order, and they even called me on the phone to let me know order was on the way." Stephanie from in Massachusetts says: "Rating: Excellent! The PACS/Radiology desk we bought is high quality. Tom Gaede was very helpful to me and I appreciate it greatly." Kelly from Seattle says: Rating: "Excellent! This is the second time I placed an order with them and both times the product was received within one week of the date of order. Jamie from Anchorage says: Got it Tom. Thank you. Installed it. It works great. Very good quality stuff. I'm happy. Excellent! Very service oriented. Returned calls quickly. Quoted excellent price with good lead time; product even arrived one day early. Tom Gaede was great. Lana from Bellingham, WA. Said: Rating: Excellent! Tom Gaede was easy to work with and took into consideration my needs and demands. He was thorough, prompt, trustworthy, and pleasant to deal with. Jean from California says: Rating: Excellent, Prompt delivery. Product as promised. Merchant went the extra distance to make sure I purchased the correct ergonomic chair. 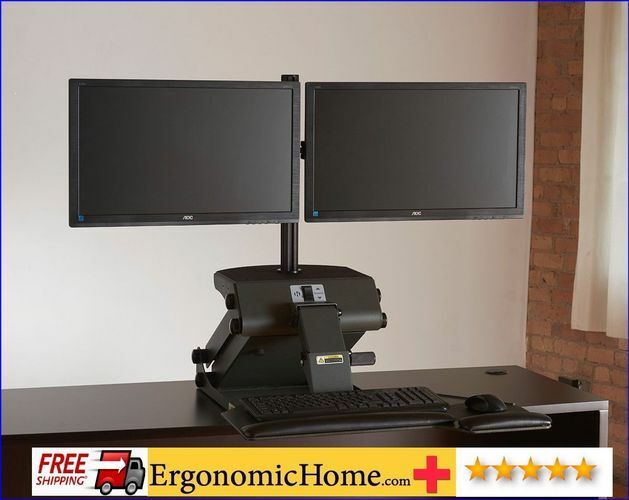 The HealthPostures Task Mate Journey #6200-6912 is a sit to stand dual monitor stand that adjusts with an electric motor. The electric motor lifts 70 lbs vertically from 5.5" to 18.5". Converts a fixed height desk to a ergonomic sit stand desk. Quick & easy installation as base ships assembled, just attach the #6912 dual adjustable monitor arm. This adjustable sit to stand workstation will fit on top of any desk or in any corner, making it a perfect choice for cubicles, corporate offices, home offices and more. Made in USA. BAA (Buy American Act) & TAA (Trade Acts Agreement) Compliant. Monitor surface: 14" x 11"
Electric motor: lifts 70 lbs vertically from 5.5" to 18.5". Keyboard tray/adjustable keyboard mechanism: is standard includes the mouse is on the right. The keyboard tray/mouse tray tilts from 5 degrees back to 10 degrees away from you to reduce the strain on your wrists. Ergonomic Home: is an online furniture store since 1997 with 39 years of office furniture experience. Questions about the Health Postures Task Mate #6100? Click to email tom at ergonomichome.com. Or phone home free to 1-877-550-2678. We are safe, sure, sound, and secure. � Copyright 2018 ErgonomicHome.com, Inc. All Rights Reserved.